We are truly blessed in the UK to be surrounded by a superb array of flatfish. All flatfish are born round, then as they grow, the eyes move to either the left or right side of the fish so they can see all around when lying on the sea bed. Left-eye fish are called sinistral (Turbot, Brill and Megrim) and right-eye fish are called dextral (all others). They all have dark skin on the ‘eye side’ and white on the ‘blind side’ except Greenland Halibut which is dark on both sides. Fillets from flatfish do not usually possess any pin bones. 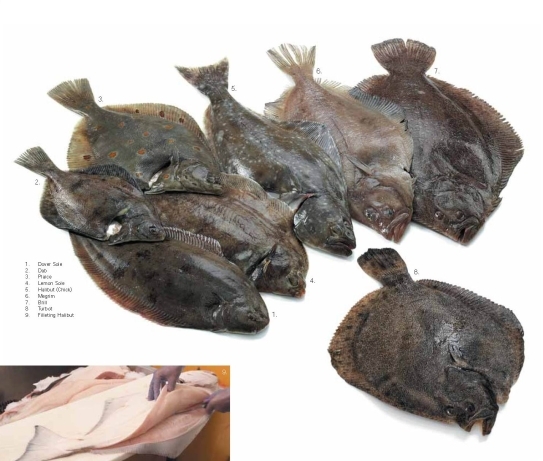 The larger species (Halibut, Turbot and Brill) can also provide excellent boneless suprêmes from fish over 3kg.